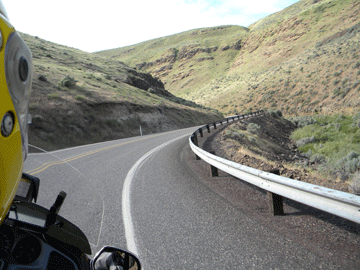 We took several short rides, the longest just 4 days, during the 2013 year up to mid-November as I write this. I have been very negligent and not written a word for our pages until now. So read on and hear about our year all at one time. I doubt that we will be going out again before the Polar Bear Ride on January first so you can consider this the end of 2013. Come back for next year's 8-month trip to the East Coast of the US. I promise to keep up to date on it. 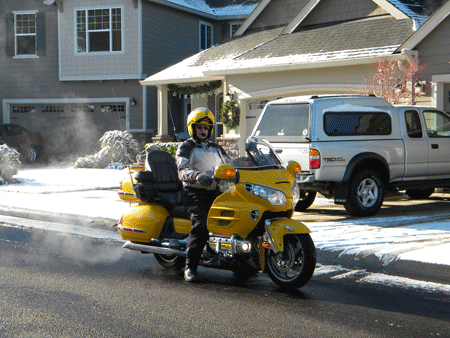 Ride 1- When we woke up on New Year's Day of 2013 it was snowing and no place to be riding a GoldWing. The weather forecast was for sun and warmer weather so we waited and waited and waited. Finally the sun broke through and we got on the road a half hour before noon. Noon is the cutoff for registrations at the Polar Bear Run. We made it just in time. 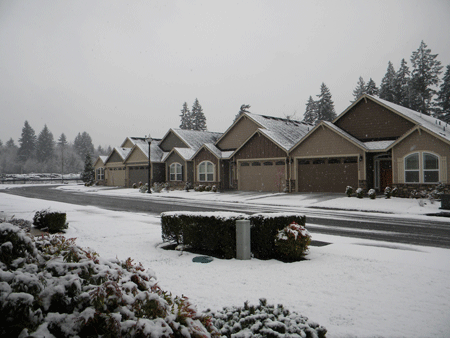 The weather in Portland, Oregon where the run is actually held was much better than it was at our house. They had sun and dry ground where we had wet roads and snow still on the lawns and walkways. To the north of our house there was even more snow and ice. The planned routes for the Polar Bear run always consists of three choices: Baby Bear- about 30 miles, Mama Bear- about 70 miles and Papa Bear- about 110 miles. They all end at the same pizza parlor for the ending point. Every year they vary the exact path taken get there. We always do the Papa Bear. This year that route went north, past our house and into the heavier snow area. Having just come from that direction we had no desire to go back. We believed (correctly as it turned out) that the shady places along the country roads would be snow and ice covered. So we went south into the snow-free countryside and had lunch at a pub before returning home. We did not do the 110 miles but I'll bet we had more fun. 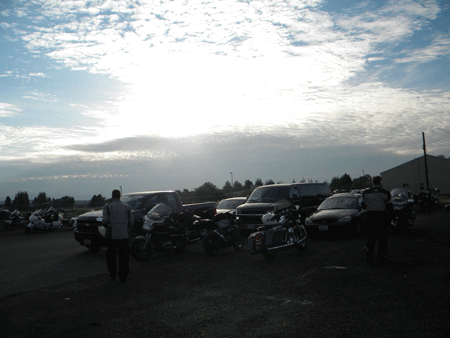 We heard that several riders had minor spills on the slick roads. Ride 2- The second ride of the year was in the middle of February. 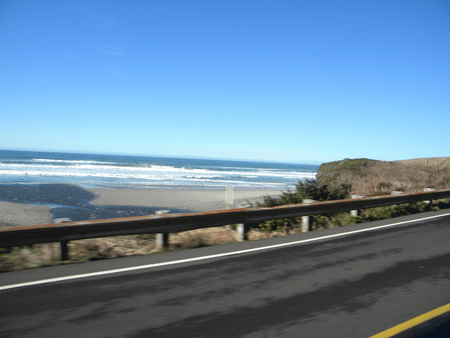 It was a ride to Brookings, Oregon, a town on the coast near the border with California. We started off with a foggy run down the freeway for a couple hundred miles. 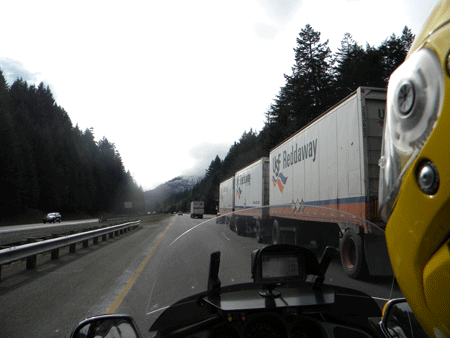 This was not the fun part of the trip but we had decided that the trip would be a loop. One quick day down the Freeway, one day in camp and one leisurely day back up the coast. From the freeway we took a two-lane road down the river to the coast at the California Border. 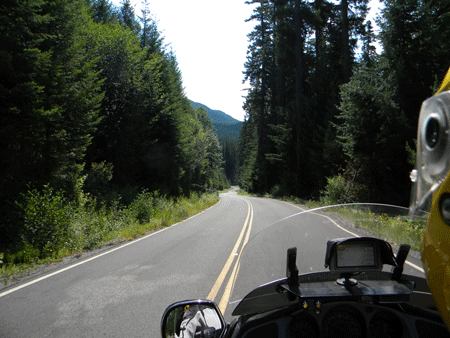 We then turned north to the town of Brookings and our campsite. 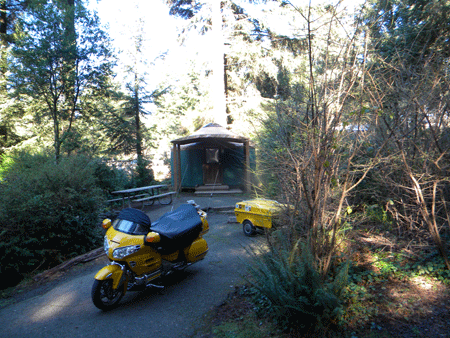 We had rented a yurt in the State Park near Brookings to stay in. The weather was forecast to be excellent but cool. We have stayed in colder places in our tent but decided to upscale it to a place with lights and heat for this trip. We had dinner at a pizza/brewpub place and had excellent beer and pizza. The next day we spent climbing the hills (me) and beachcombing for pretty rocks (Kathy). For her birthday I had bought her a rock polisher because she is always picking up these rocks. We brought several pounds of them home from Europe. Now she can make them all nice and shiny! The route back on the following day was up the coast for a couple of hundred miles and then inland to home. Ride 3- In March we had a beautiful blue-sky day and Kathy had it off, so we decided to go to the Wet Dog for lunch. 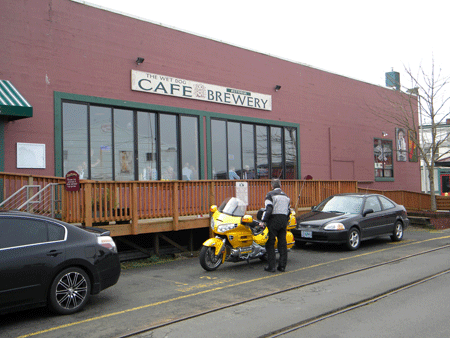 The Wet Dog is a cafe/brewery in Astoria at the mouth of the Columbia River. They have an amazing array of different burgers. You can get a burger with just about any kind of toppings and additions. One of the selections is call The Puppies. It is two small burgers made in any of the possible combinations. We usually get that and then each take one of the burgers. After lunch we headed out to the old WW II fort near the actual mouth of the river and looked around. 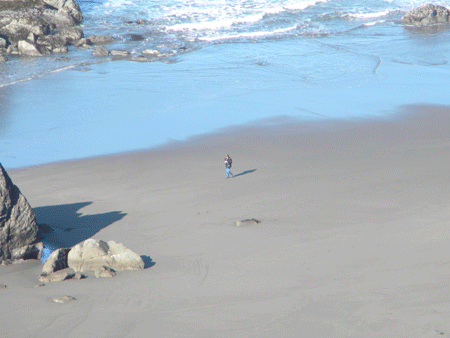 Kathy looked for rocks and I talked with another visitor to the beach. He has a bike but smaller. 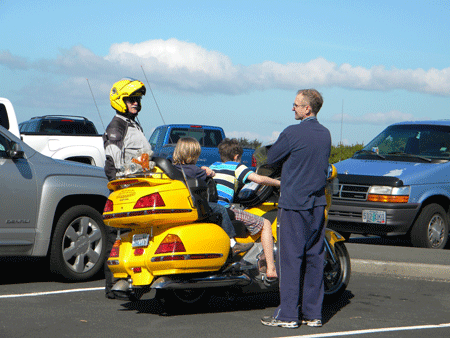 His kids wanted to try out the GoldWing so I let them get on while he and I talked bikes, roads and rides. 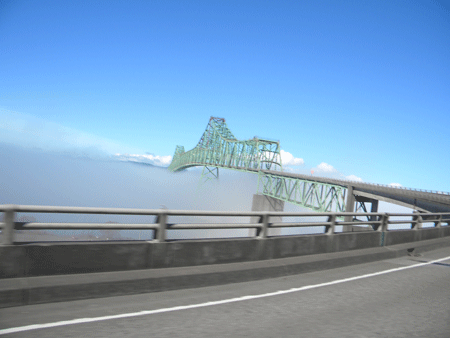 The way back was to cross the bridge, above the river fog, and follow the north shore back to the freeway. 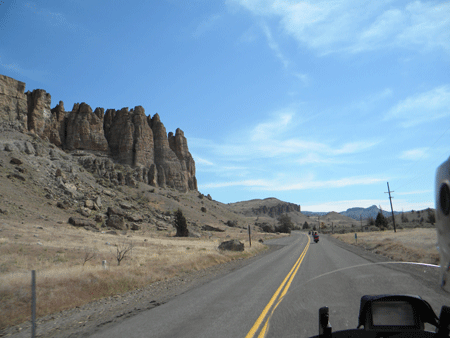 As we rode the north side of the river we could see in the far distance our favorite news-making mountain, Mt. St. Helens which had erupted in 1980. Mt. St. Helens is a small white hump almost centered in the picture. 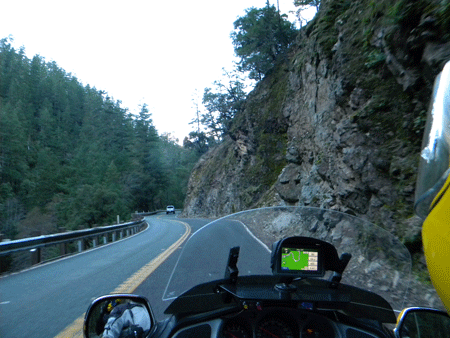 Ride 4- This ride was a three day trip to a beach where we had been told there were lots of Agates to be found. 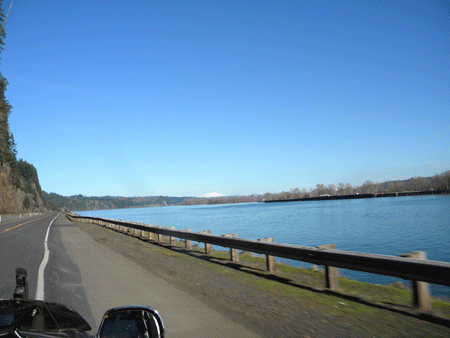 The day starts with another ride down the south side of the Columbia River to the town of Astoria near the mouth of the river. 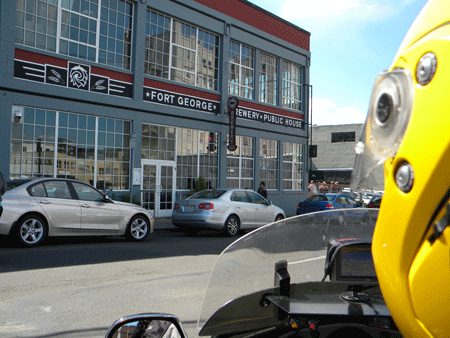 This time we had lunch at the Fort George Brewery. (I'm a home brewer and like to try out the competition.) I don't feel that one beer on a full stomach of food hinders my riding ability. When the waitress asks if I want another, I tell her that I have to keep the number of beers fewer than the number of wheels. After lunch we headed to the state park and to claim a campsite. 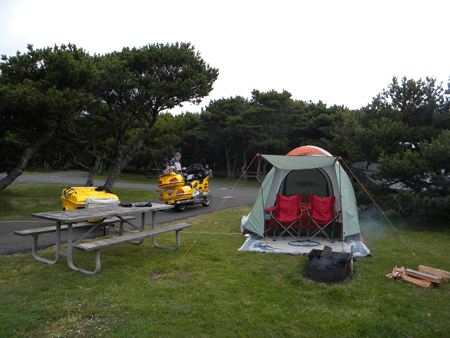 We set up camp under a low, but dry, cloud cover and lit a fire for warmth. We checked the tide table for low tide tomorrow and made out plans to go hunt agates. 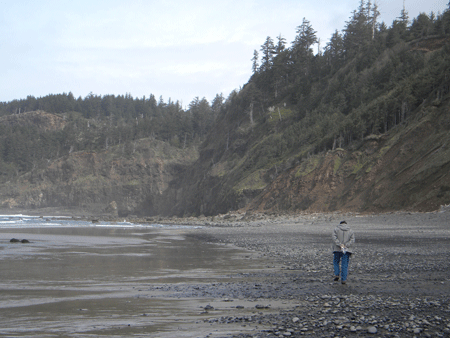 The next day we followed the directions I had been given to the trailhead that led down to the tiny beach with all the agates. We both looked for a while, finding quite a few agates but I got bored with it and found a comfy rock and read my book. Kathy continued to search. After all she has that rock polisher to fill. After sitting on that rock for a while it lost its comfort and I wandered again. 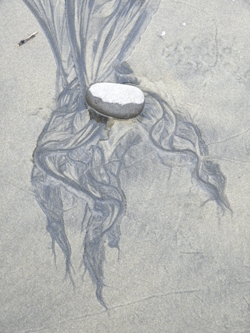 This time I found that the outgoing tide had left some very interesting patterns in the sand. This is just one of them. When Kathy had collected several pounds of agates we left and returned to camp. I waypointed the beach trail in my GPS so it will be easy to find again. The following morning we returned home. 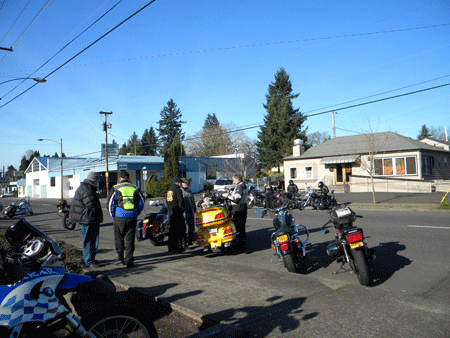 Ride 5- The Rose City Motorcycle Club in Portland, Oregon has several rides that are open to all motorcycles. 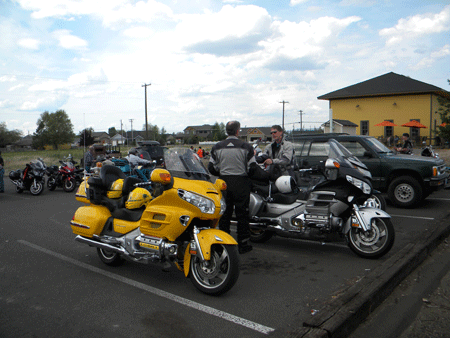 One of them is the Oregon 500, a one-day 500-mile ride. It starts early and ends late. The day was forecast to be good with blue sky and fluffy clouds. 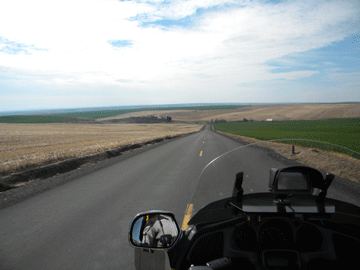 The route this year was east through the Columbia River Gorge and then into the canyons and wheat fields of eastern Oregon. We rode with our friend Mark this year. We tend to ride alone or with only one or two other bikes. This simplifies rest, fuel, food, and potty stops. A group seems to always travel at the rate of the smallest bladder and fuel tank. Unless there is a smoker and then one must add in smoke breaks too. Mark has the same fuel and bladder size that we do. The OR-500 is not a race and not really a poker run. You are given written directions like a poker run and there are checkpoints that must be hit but there is no need to pick up points or cards at the checkpoints. The scoring is done on the basis of time and mileage. Everyone runs the same course, supposedly. But side trips for food, fuel, missing a turn and going back, etc. add to the mileage. Also everyone's odometer measures differently. The scoring at the end is done by taking the odometer reading at the start and finish, and the time of each rider's start and finish and then the average of everyone is calculated. The winner is the rider who is closest to both. the same is done for passengers. The closest we have ever come is Kathy winning 3rd place passenger. Go on to Page 2 of 2013.